Grandpa Xerox is very proud! In MY day, we only had a black and green text screen, and we had to login in binary encoded assembly, and we LIKED IT! So that is where Eee’s come from. cool. Thanks, man, gave me a laugh. Or should I say, gave me a LOL. For me it was an LIQ, but good nevertheless. because I don’t get it at all…. You see, when two computers fall in love…. 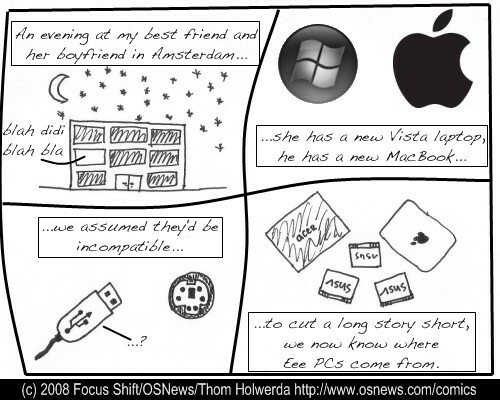 That Apple was unfaithful, and slept with the neighbours ASUS. They come with some retarded Xandros thing, so Ubuntu goes on, and then all is well. That’s the first one I’ve understood in a long time. I haven’t even understood a lot of the ones that were subsequently explained. What was really funny! Thanks.